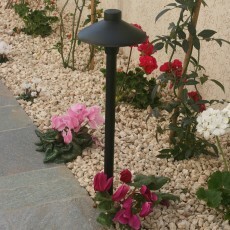 Elipta spike-mount spreadlights provide a soft pool of light in a landscape for the illumination of paths or steps and around the terrace, drive and lawn. 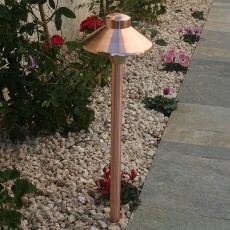 Natural copper lights typically weather to a mottled brown finish and may acquire a verdigris patina over time. The Midas and Domo copper shades are painted white underneath to maximise light spread. 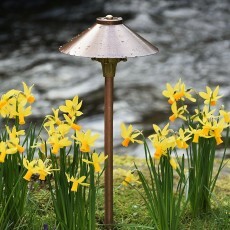 These models feature high-grade spun copper shade, tubular copper stem, pressure die-cast brass body, brass fixings, fitted with a 2m 2 core cable and supplied with polycarbonate ground spike. 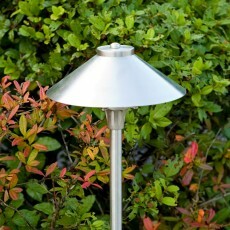 G4 CAPLED lamp sold separately. 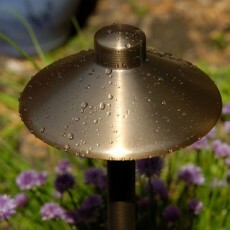 A frosted lens diffuser is a common feature in all our spreadlights, and helps protect the lamp from irrigation spray. 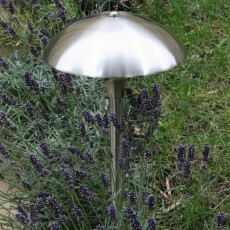 The shade and dome assembly is easily removed and replaced with a screw action, so tools are not required for changing the lamp. Slightly smaller Nebula (black and bronze) and Nova (copper) spreadlights also take a G4 CAPLED lamp and are fitted with a 1.5m cable with IP44 Plug&Play connector for easy installation with Plug&Play transformers and accessories.